Over the course of your lifetime, you might be missing one tooth, or some, or even a lot of your teeth because of an injury, natural aging, decay, or other explanations. In the past, when you were missing a tooth or teeth, then you could only fix it using removable dentures or a bridge. However, with the modern advances in dentistry, you finally have the alternative of restoring a lost tooth or teeth with implant-supported restorations. Made to appear natural and work like real teeth, implants can rejuvenate your smile whether you've lost a single tooth, many, or all your teeth. If you're considering an implant-supported restoration that looks great and lasts a long time, ask your dental practitioner in Pearland, TX for more information on implant options. At Highland Dental Care and Ortho., we use high-quality implants and custom restorations for those who want a crown (for a single tooth), a bridge (a couple of teeth), partials (the majority of the teeth), or complete dentures (all the teeth on one or both arches). If you've been dismissing your lost teeth or you're annoyed with removable dentures, then you could be a fantastic candidate for an implanted restoration. An implant is a metal post that's screwed into the jaw socket. After your post(s) has healed into your jaw and gums, then it'll be powerful enough to hold your custom-made crown, bridge, or denture. At Highland Dental Care and Ortho., we offer implant placement with sedation to help keep patients relaxed and calm throughout the process. In addition, we use top-quality crowns, bridges, and dentures for attractive outcomes. Based on which restoration is necessary, one or many implants might be needed to make sure your restoration is strong and secure. Our team at Highland Dental Care and Ortho. will give you amazing care and compassion as we take you through the implant restoration process. WHAT MAKES DENTAL IMPLANTS THE RIGHT CHOICE? If your tooth or teeth are lost, it may result in multiple issues. The hole created by a lost tooth may make it possible for your other teeth to move into misalignment. This malocclusion may result in issues, such as TMD (temporomandibular joint disorder). Also, if there's no tooth to keep the gums and jaw stimulated, atrophy may result in other dental issues as well as facial deformity. 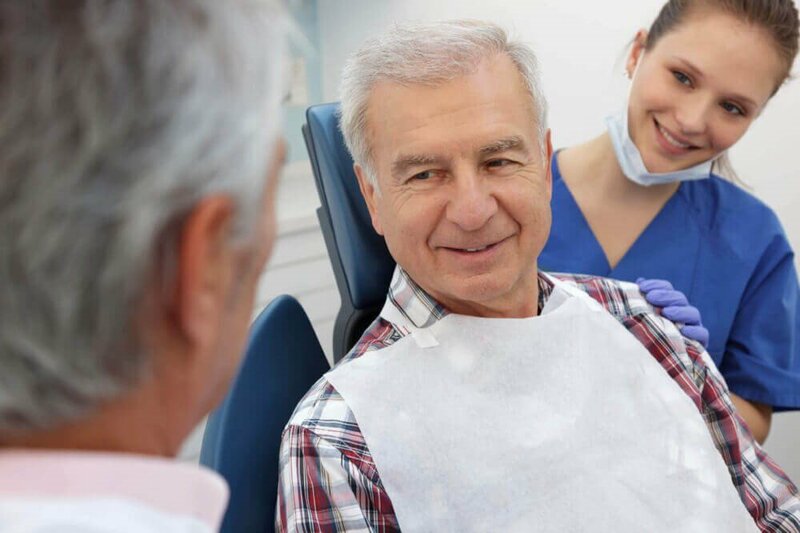 Unlike conventional removable dentures or even a bridge and crown that's kept in place with dental adhesives, a restoration attached to an implant helps to keep your whole mouth healthy. Another significant reason why Pearland, TX patients are looking into implant-supported restorations is how normal that they appear and the way they work like your real teeth. Implants integrate with your gums and bone so the connected restoration is secure enough to eat any foods plus it needs no special maintenance. When your implant and restoration are attached, your teeth should be cleaned twice every day, also you must get cleanings and dental examinations at your dentist's office in Pearland, TX. When compared with conventional bridges, crowns, and dentures, implanted restorations are longer lasting if cared for properly. An implanted crown replaces a single tooth. When your implant has healed into your jaw and gums, then a custom-made crown can be connected. The crown will be shaded and shaped to match with your teeth to give you a beautiful outcome. For extra security, an implant may be connected to your bridge. An implanted bridge utilizes one post that is connected to a false tooth, which is then attached to crowns that are put on top of neighboring teeth. To restore several, but not all your teeth on one arch, implant partials may be utilized. Implants will be strategically placed then connected to your customized partials. When you're missing all your teeth on your top and/or bottom arch, implanted complete dentures are an option. After several implants have been placed and healed into your mouth, custom-made dentures can be connected. As soon as you and your Pearland, TX dentist have decided an implanted restoration is ideal for you, an implant surgery can be scheduled. Prior to your appointment, your dentist will take x-rays along with other innovative imaging to make a graph of the ideal place to place the implant(s). The day of the implant surgery, you'll have to stick to any directions provided by your team. At Highland Dental Care and Ortho., we provide many methods of sedation to help keep you comfy during your procedure. As soon as you're ready and your mouth is prepped, an incision will be made through your gums so they can implant the post. This will be repeated if several posts are necessary. When the implant(s) is set, the incision(s) will be stitched. The visible part of the post(s) may be given a temporary cover to protect it as your mouth heals. Your dentist can write a prescription for antibiotics, pain medicine, and/or an anti-inflammatory to help throughout your healing. You should aim to take it easy following your surgery and eat a soft foods or liquid diet. You'll have to schedule another appointment about a week following your procedure to get your stitches taken out and so that your dentist can examine your recovery. It takes roughly 3 – 6 months for osseointegration (your implants healing into your tissue and bone). In this time period, you might have to schedule more appointments with your dentist in Pearland, TX so they can examine your recovery progress and gauge how much time it's going to be before your custom-made restoration can be connected. After your implant(s) is secure enough, your dentist will be able to finish the procedure. Although the final visit ought to be rather simple and cause little to no discomfort, numbing cream together with a sedation method might be offered to help keep you comfy. Once your temporary cover is taken off, your team will connect your custom-made restoration to the post(s) and can make modest adjustments as necessary to enhance the overall fit. Prior to leaving, your dentist will discuss how to care for your implant(s) and restoration. Among the main advantages of all implanted restorations is they are treated exactly like your own teeth. You're able to eat caramel, corn on the cob, along with other foods without the fear that your teeth will come out. But, it's still important to look after your teeth using a home oral hygiene regimen. You need to floss and brush at least two times per day. If you want assistance with your flossing or brushing technique, our staff at Highland Dental Care and Ortho. is pleased to show you and provide you hints during your examination and cleaning. You need to continue to schedule your yearly oral health examination and twice-yearly cleanings with your dentist in Pearland, TX. Sometimes, your dentist might suggest visiting more frequently for examinations or cleanings. Even though implanted restorations are durable, you might have to get them replaced at a certain point. At your examination, your dentist will assess your restoration and implant(s) so that they can tell whether you will need a replacement. ARE YOU READY FOR AN IMPLANT-SUPPORTED RESTORATION? An implanted crown, bridge, or dentures can improve not just your appearance, but your life. Dental implants enhance the look of your grin and return you to everyday activities like laughing, eating, or even talking with other people without the stress of a hole in your grin or loose dentures. Whether you would like to replace one tooth or many teeth, implanted restorations return your confidence. To find more information, call our office in Pearland, TX and schedule an implant-supported restoration examination.